Join us at the Auckland Boxing Association for a charity boxing event in support of the Prostate Cancer Foundation of New Zealand. 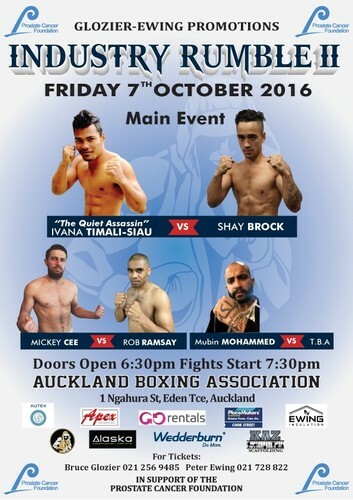 Ivan "The Quiet Assassin" Timali-Siau versus Shay Brock. Corporate tables are available as well as General Admission of $50 on the door ($40 if bought prior to 7th October). For Tickets: Please contact Bruce Glozier on 021 256 9485.